Get a load of this chain link fence. I would like to see a close-up of where the “normal” links intersect with the crazy-patterned links. …UPDATE: The designers’ website offers a close-up. It’s hard to determine how this was constructed. 1. The pattern of traditional repetitive square shaped links are interrupted by the splash of floral-like links. The biomorphic, floral links contrast agains the repetitive square links, yet the floral pattern sits in harmony with the traditional squares. Both are metal lines interesecting and interweaving into itself. Both applications also serve the purpose of fences: protection. 2. 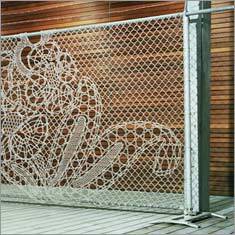 One of my favorite parts of this design is the top portion of the fence where the bar meets the crazy pattern. It’s that dip. So subtle, yet so bold. This fence would command interest if there were only that little dip. And it’s just not the dip. The metal surrounding the dip is smooshed together. It’s as if that portion of the fence was stretched. This design is by Studio De Makers Van. It is appropriately titled, “How to Plant a Fence”.